Paul Ajosshi: Dokdo The Musical? A couple of weeks ago I had the chance to see a new children's musical called 강치대왕의 쿠키상자 (roughly translates as "King Sea-lion And The Cookie Chest"). I'll spare you the details as to the content and quality of the musical (I'll just say there's no need for you to spend your precious time on it), but I will point you to something which made me feel rather uneasy about the whole endeavour. 독도를 지기던 바다사자 강치가 뮤지컬로 돌아왔다! This roughly translates as (and please feel free to correct) "The Sea-lion that guards Dokdo has come back to the musical!" or some such nonsense. "Perhaps I should stop writing in this fashion as it may start to annoy people." I retort. 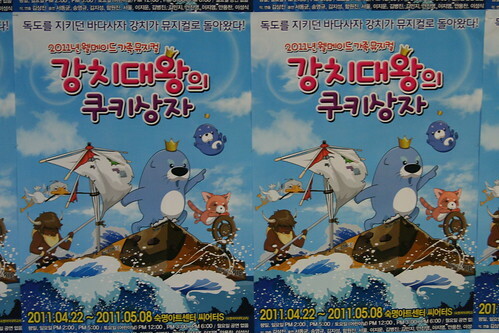 Dokdo is mentioned approximately twice in the whole musical, it carries no relevance to the story, it doesn't enhance the plot and there is no musical number singing the praises of the Liancourt Rocks (though there is a furry cat scarf that blows bubbles out of its mouth which I thought was brilliant). In my opinion Dokdo has been thrown on the poster in an attempt to boost audience numbers through nationalistic sentiment. This makes me feel ever so slightly cheap and dirty. If you want to make a musical about Dokdo then fair enough, but if you're going to name drop Takeshima twice and then forget about it, then I'm of the opinion that it should hold no place on your poster.